Seoul cannot agree to Pyongyang’s terms without backing from the U.S. — and that’s unlikely to happen. The most recent round of mini-détente on the Korean peninsula began with a surprise visit by a high-caliber North Korean delegation to the closing ceremony of the Asian Games last October. Though the two sides agreed to more meetings later in October or November, North Korea backed off, citing consternation over activists’ leaflet campaigns. On December 29, Seoul’s unification minister, Ryoo Kihl-jae, sent a letter to the North, seeking negotiations on bilateral issues such as family reunions for those separated by the Korean War (1950-53). Just yesterday, a ministry spokesman reiterated the offer. To this, North Korea responded with a demand that Seoul lift sanctions that have been in effect since May 24, 2010 following North Korean attacks on a South Korean border island and corvette. Despite media attention and concerted efforts by the Park government to reach out to the North, common sense and past experience warn us not to get overly excited. Yet, however strong the domestic pressure on Park might be to put her mark on North Korea policy, her options are rather limited if she wants to maintain policy coordination with the U.S. She cannot address North Korea’s security concerns independently of the U.S., and North Korea has done very little to ameliorate U.S. concerns. In fact, the U.S. recently enacted additional sanctions on North Korea following the cyber attack on Sony over the satirical film The Interview, which portrays the assassination of Kim. 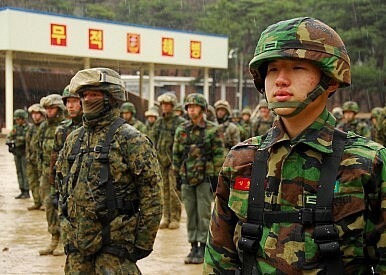 Yonhap speculates that “Seoul and Washington may be out of sync over how to deal with North Korea, with the U.S. trying to tighten sanctions and the South seeking dialogue with the communist nation.” Despite this, a State Department representative commented that there is “no daylight” between U.S. and South Korea on efforts to improve inter-Korean ties. The U.S. firmly rejected this “implicit threat” and called on North Korea to make clear commitments to denuclearization. Key Resolve and Foal Eagle are major exercises – last year, these two drills involved more than 12,000 American soldiers and some 210,000 South Korean troops. Still, the U.S. maintains that these annual exercises are defensive in nature. But as North Korea points out, there is precedent for calling a halt to the drills. In the 1990s, the Team Spirit Exercise was discontinued at Pyongyang’s request. In the past, cancelling U.S.-South Korea exercises was a way to provide reassurances in the hopes of making North Korea more amenable to denuclearization. That is no longer an option the U.S. is willing to consider. Despite differences over how to approach North Korea in the economic and cultural spheres, when it comes to security matters, the U.S. and South Korea are acting as one in rejecting the North’s demands. For the sake of the suffering Korean people, one wishes for a speedy negotiation that will allow for as many family reunions as soon as possible, but it does not appear to be a very realistic outcome. What the North wants is regime security and so right now, Pyongyang is most concerned with either stopping the U.S.-South Korea joint exercises or getting sanctions eased. Neither of these options is a concession that Seoul can offer without U.S. backing – and that’s not likely anytime soon, given the current adverse dynamics of U.S.-North Korea relations. So get ready for another round of frustration in which Pyongyang tries to play one bargaining partner off another. Who’s Right About the New US-South Korea Joint Military Exercise? Making sense of the new Dong Maeng drills.